Each of these "pinball-like attempts" of the thrombus to escape from the aneurysmal cavity into the left atrium was halted by a relatively narrow neck of 1.3 cm diameter. Another smaller thrombus was seen attached to the lateral wall of the aneurysm. The diagnosis was further confirmed by cardiac magnetic resonance imaging (MRI). Resection of the aneurysm was done with median sternotomy approach under cardiopulmonary bypass. Postoperative period was uneventful. Aneurysms of the left atrium may be congenital or acquired. , They are considered to be congenital if they arise as a primary lesion from an otherwise normal atrial chamber  and acquired if they develop secondary to raised left atrial pressure. Congenital aneurysm of the left atrium is a very rare entity. Only a few cases are reported in the world literature. These aneurysms most frequently involve the atrial appendage. Victor and Nayak  attributed the aneurysm to congenital dysplasia of the musculi pectinati in the left atrial appendage and of the bands of atrial muscle from which they arise. In their patient, the neck of the sac was wide, and they attributed it to the failure of lax inner and outer bands to constrict the base of the appendage. In our patient, the neck of the sac was narrow. So, there may be some other mechanism in addition to congenital dysplasia of these muscles. Although congenital, the majority of the patients are asymptomatic until adult age, when complications such as cardiac arrhythmias and systemic embolization may occur. Clinical presentation in childhood as in our case is even rarer. Atrial thrombi occur, especially in patients with atrial arrhythmias. Even in the absence of arrhythmias, emboli have occurred in patients with LAAs as in our patient. Stasis of blood within the aneurysm probably predisposes to thrombus formation. Some patients complain of angina pectoris. A chest X-ray showing prominent left cardiac border should raise the suspension of left atrial aneurysm. A 2-D echocardiography imaging with color and pulsed-wave Doppler is the most useful noninvasive diagnostic modality which typically shows the cyst-like structure connected to the left atrium and demonstrates the flow through the communication between the aneurysm and the body of the left atrium as in our case. The body of the aneurysm typically causes indentation of the left ventricular wall. 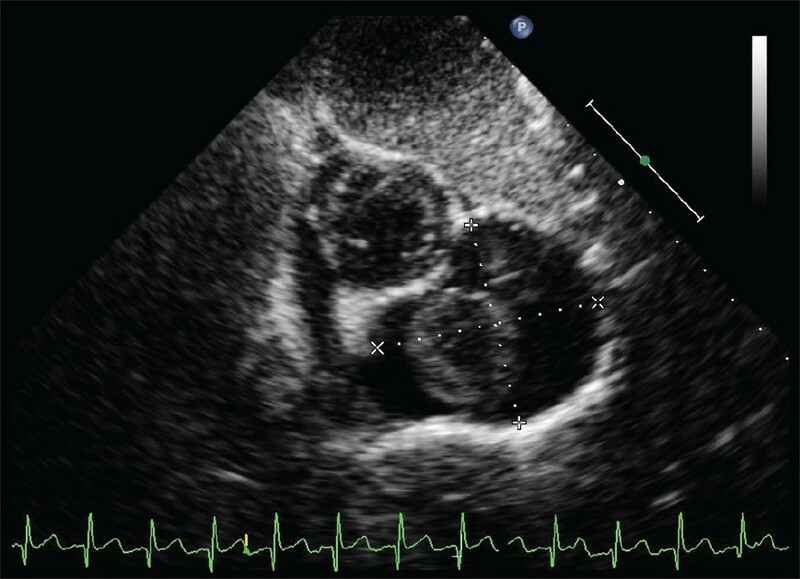 Differential diagnosis on echocardiography imaging involves acquired left atrial "aneurysms," extra pericardial herniations of portions of the heart, solid or cystic paracardiac tumors and pericardial or extracardiac fluid collections, and an enlarged coronary sinus lying behind the heart. 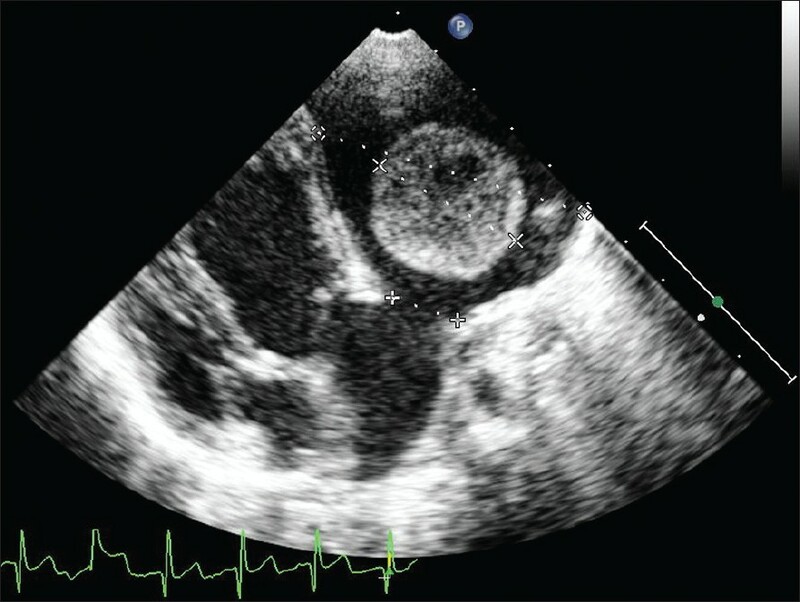 Transesophageal echocardiography is a useful additional diagnostic tool, particularly for the detection of thrombus. Magnetic resonance imaging is also helpful for establishing the diagnosis and delineating the relation to the surrounding structures. The complications associated with this abnormality can be devastating. Hence, surgical resection is recommended even in an asymptomatic patient. Some surgeons approach the left atrium via left thoracotomy. In view of the large thrombus in our patient, median sternotomy with cardiopulmonary bypass was done for the complete removal of the aneurysm and clot. Surgery is an effective therapeutic measure and there are no reported operative mortalities. 1. Foale RA, Gibson TC, Guyer DE, Gillam L, King ME, Weyman AE. Congenital aneurysms of the left atrium: Recognition by cross-sectional echocardiography. Circulation 1982;66:1065-9. 2. Bramlet DA, Edwards JE. Congenital aneurysm of left atrial appendage. Br Heart J 1981;45:97-100. 3. MacLeod CA, Ankeney JL, Perrin EV, Nickel SS, Liebman J. Left atrial aneurysm. Am Heart J 1970;80:683-6. 4. Victor S, Nayak V. Aneurysm of the left atrial appendage. Tex Heart Inst J 2001;28:111-8. 5. Krueger SK, Ferlic RM, Mooring PK. Left atrial appendage aneurysm: Correlation of noninvasive with clinical and surgical findings: Report of a case. Circulation 1975;52:732-8. 6. Hoffmann U, Hamed N, Herold C, Globits S. Radiologic signs of left atrial aneurysm. Eur Radiol 2000;10:1332-4. 7. Burke RP, Mark JB, Collins JJ Jr, Cohen LH. Improved surgical approach to left atrial appendage aneurysm. J Cardiothorac Surg 1992;7:104-7.